It was more than just the start of classes this week for University of Oregon Portland. It was also a cause for celebration. Spring term marks the 10-year anniversary of the opening of the White Stag Block, the place where the university consolidated its long-standing Portland programs and began its modern vision in Oregon’s largest city. An open house to mark the occasion is Tuesday, April 17, from 4 to 7 p.m. 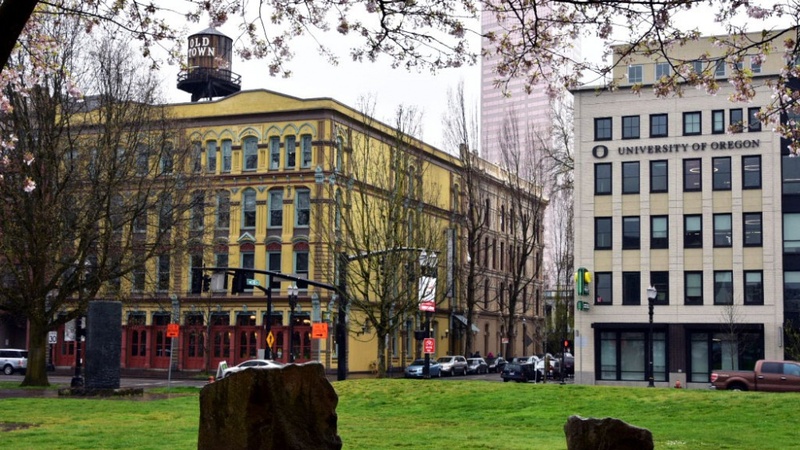 While the opening of the White Stag Block gave the UO a prominent home in Old Town, the university has had a continuous presence in Portland for 135 years, dating to the opening of its law school. The UO also oversaw the medical school that eventually became Oregon Health & Science University. Academic programs in architecture, law, business and journalism, as well as student support and development offices, were located in a variety of spaces in Portland during the last half of the 20th century. Most of those programs moved to the historic White Stag Block in 2008, with the Lundquist College of Business moving across the street to 109 NW Naito in 2017. UO academic programs in Portland primarily focus on graduate, professional and executive coursework, along with research and projects with community partners. Other programs, such as advancement, admissions and career services, focus on strengthening the connection of UO alumni, faculty and students to Eugene. The open house is a free community event to celebrate and showcase UO Portland. The event — part of Design Week Portland — will feature aspects of UO Portland programs, such as 360 video and virtual reality demonstrations by the School of Journalism and Communication, product demonstrations by sports product management students, and a workshop on cleats by the sports product design program. The Duck will make an appearance and be available for photos with guests.